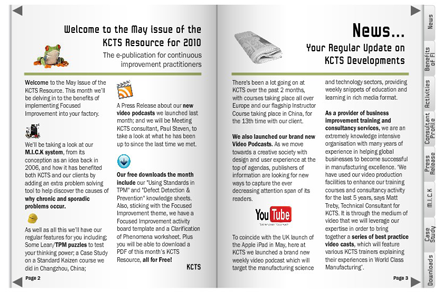 We have just released the May Issue of the KCTS Resource: This month we’ll be delving in to the benefits of implementing Focused Improvement into your factory. We’ll be taking a look at our M.I.C.K system, from its conception as an idea back in 2006, and how it has benefitted both KCTS and our clients by adding an extra problem solving tool to help discover the causes of why chronic and sporadic problems occur. As well as all this we’ll have our regular features for you including; Some Lean/TPM puzzles to test your thinking power; a Case Study on a Standard Kaizen course we did in Chang Zhou, China; a Press Release about our new video podcasts we launched last month; and we will be Meeting KCTS consultant, Paul Steven, to take a look at what he has been up too since last time we met. Our free downloads the month include our Using Standards in TPM and Defect Detection & Prevention knowledge sheets. And sticking with the Focused Improvement theme, we have a Focused Improvement activity board Template and a Clarification of Phenomena worksheet. Plus you will be able to download a PDF of this month’s KCTS Resource, all for Free! This entry was posted on Tuesday, May 11th, 2010 at 14:44	and is filed under KCTS Resource. You can follow any responses to this entry through the RSS 2.0 feed. You can leave a response, or trackback from your own site.